The primary aim of Agriculture Education/Agribusiness/FFA at the high school level is to develop within each student an interest and understanding of the job opportunities in agriculture and to develop selected abilities needed by students who are preparing for employment in this broad occupational field. See schedule on pages 1 and 2 for entry and release times of all exhibits. Only active Mercer County North Dakota FFA members are eligible to exhibit static exhibits in this division. All entries must be certified by the chapter advisor. Only one like item per lot may be exhibited in static lots unless otherwise indicated. 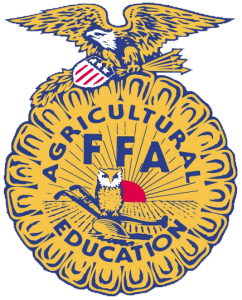 FFA entries will be handled as a part of the Mercer County Fair and subject to the general rules of the fair and shall be in keeping with the general policies and regulations governing FFA and Agriculture Education activities. FFA Division is open to other North Dakota FFA chapters for livestock. Refer to the North Dakota State Fair FFA Book for rules and lot numbers. All North Dakota FFA members may exhibit in the open class livestock, and poultry and rabbit classes. Submit entries by Friday at the fair on the official open class entry forms. In any other division, FFA members must make a separate entry for the open class show.